At 7:00 PM on the evening of March 15th, 1912, the four-masted schooner Herbert D. Maxwell left her anchorage near the mouth of the Magothy River and sailed southeast across the Chesapeake Bay toward Kent Island. Built in Maine and designed to haul lumber, the 186 foot cargo ship carried 1150 tons of fertilizer from Baltimore bound for Wilmington, North Carolina. At her helm was her captain and master, William Quillan accompanied by his brother Elay and first mate J.C. Scott. She carried an additional crew of six deck hands. Since winds were mostly calm, it had been slow going down the Chesapeake. After a drowsy sail to just south of Sandy Point, the wind completely died causing Captain Quillan to drop anchor once again. The crew slept until roused by a building northeast breeze at 3:00 AM. Quillan gave the order to the mate to get underway. 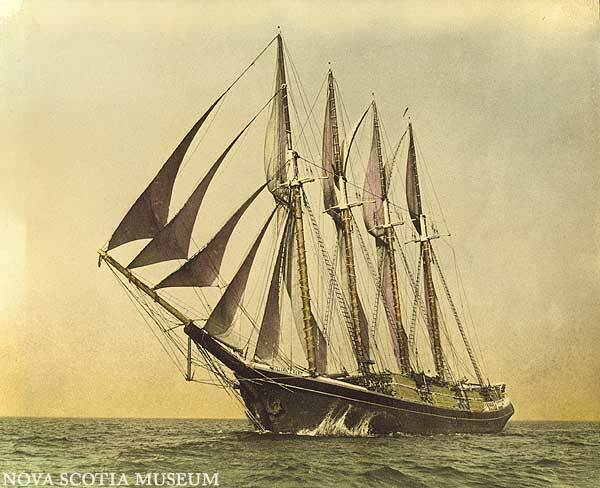 After pulling anchor and setting sail, The Maxwell ran under clear skies before a 15-knot wind for about 40 minutes when her lookout made an ominous call, “Lights of a steamer, dead-on ahead!” Three minutes later, at 4:44 AM on March 16th, the wooden schooner was ripped apart by the 3200-ton northbound steamship S.S. Gloucester. She sank quickly carrying the first mate and three other crew members to their deaths. 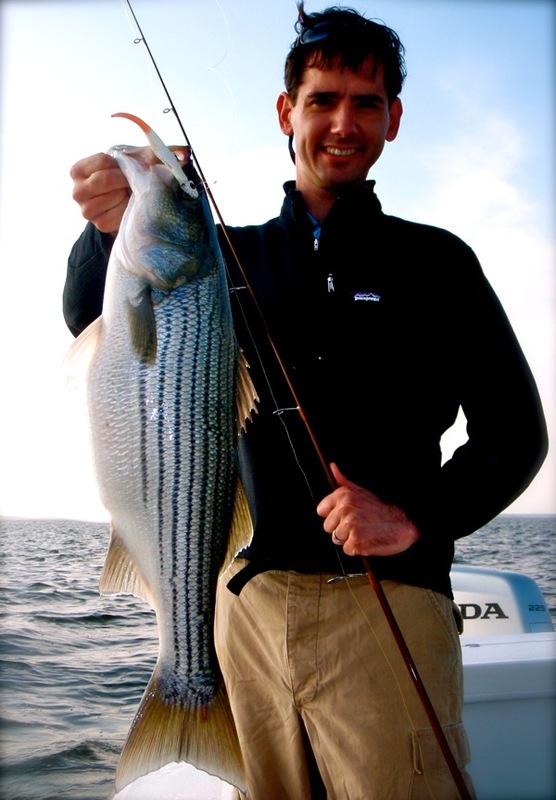 If you’re following my fishing reports you know that I’m usually scanning humps and ledges this time of year looking for schooled and feeding stripers. Light tackle casting has been hit & miss over the past week due largely to stained water. The annual may worm hatch and unpredictable weather has made fishing even more difficult. We’ve still managed a few decent evenings and landed some nice fish – a few over 30-inches – using 6 or 10-inch hotrodded BKDs while sizing the jig heads to keep contact with the hard oyster bottoms. Rapid current and relatively low light has been essential. 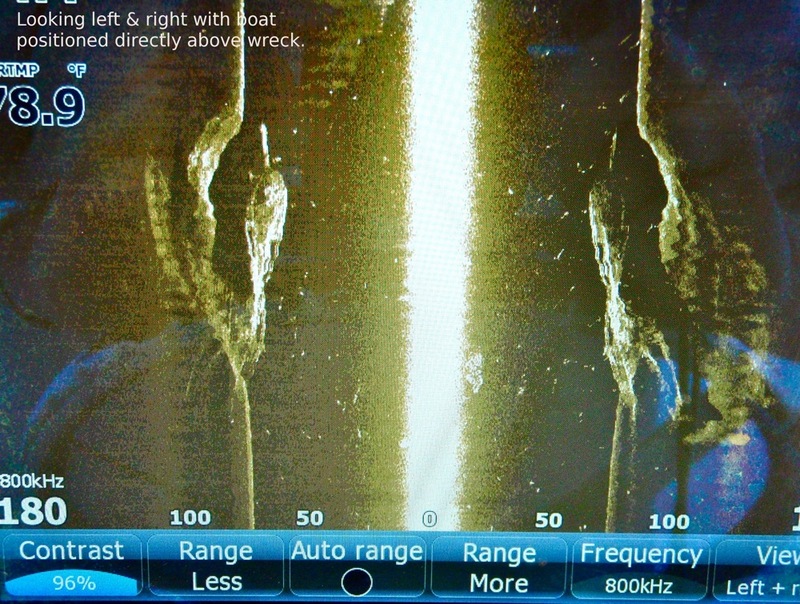 This year and last I’ve had the added advantage of side-scan sonar to help me locate fish around underwater structure or staging on humps and ledges. Not only has it resulted in a few stripers that I otherwise wouldn’t have seen, it’s turned up a few shipwrecks I never would’ve known about. 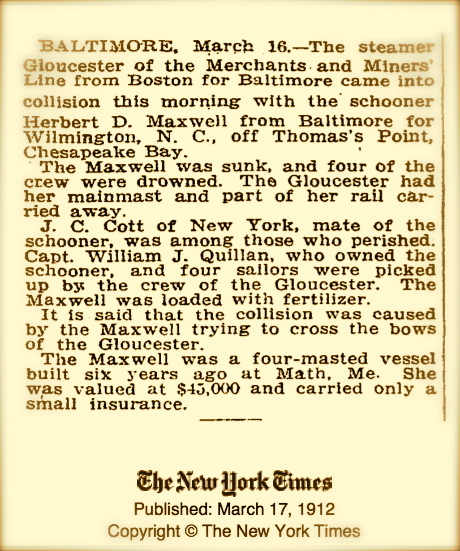 What happened that deadly March night after the lookout on the Herbert D. Maxwell spotted the steamer Gloucester depends on whose report you believe. 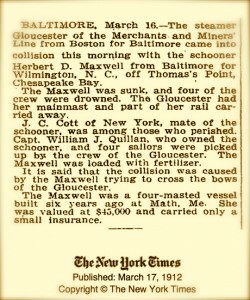 The crew of the steamer claims the Maxwell attempted to cut across their bow under full sail. The first officer of the Goucester wrote that he put the helm of the steamship hard aport when he noticed the schooner in his path. Captain Quillan, who survived by clinging to wreckage until he was rescued, counters that he had no choice but to take evasive action because the steamer turned right into his course. His remaining crew backed-up his account. The case went to court and the maritime judge believed neither story, instead coming up with his own version of events while holding both parties equally responsible. The wreck of the Herbert D. Maxwell is relatively well known to history buffs and underwater archaeologists. 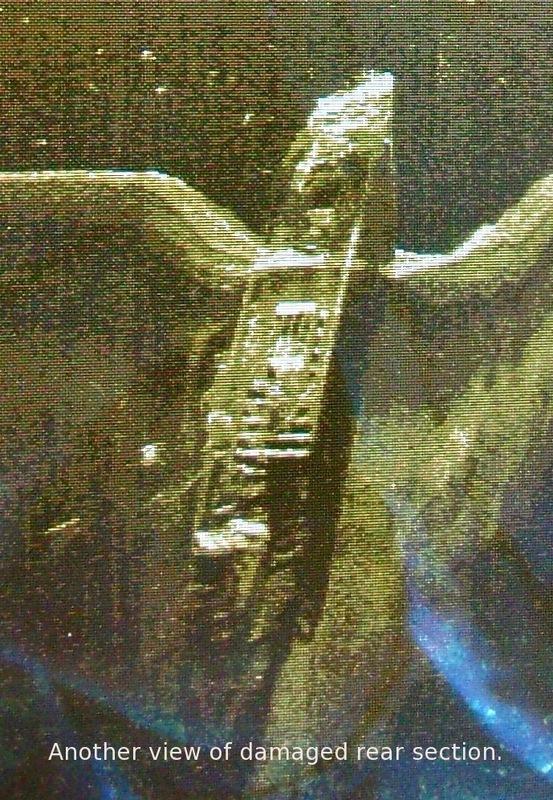 I heard of her several years ago, and even marked the spot where I thought she might be when I spotted a lump on the bottom as I crossed the Bay from Matapeake to Annapolis. I’d forgotten about her until my interest was piqued by a visit last Saturday to the Kent Island Day celebration in Historic Stevensville. 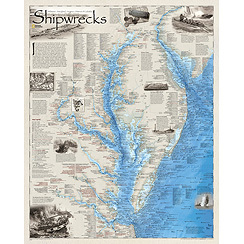 An antique map vendor sold me a poster produced by National Geographic called, Shipwrecks of Delmarva. I noticed the wreck on the map and decided to find out as much as I could. The first step in my research was to look through old newspaper articles. I found reports of the wreck in The Washington Post, The Chicago Daily News, and New York Times. Digging deeper, I checked government records, first coming across a 1912 report by the U.S. Army Chief of Engineers about efforts to mark and remove the sunken ship. The report states that 350-pounds of 60-percent dynamite was used in an attempt to clear the wreck from obstructing the shipping channel. Her high masts were blown off and the stern section taken away. The owners made several unsuccessful attempts to recover and salvage the rest of the ship, but eventually gave up. She was left where she lay on the bottom since she no longer posed a threat to navigation. Continuing my investigation, I found the archived report from the federal judge who ruled both ships at fault. His detailed ruling cites accounts from both crews along with his personal theory of the events leading up to the crash. You can read it in the Federal Register, September 1912 Volume 197. 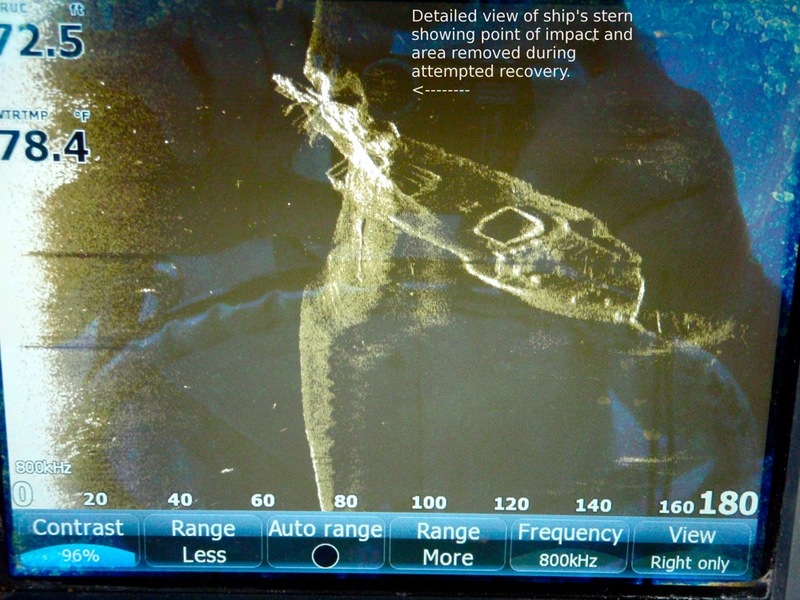 In more recent times, the National Oceanic & Atmospheric Administration (NOAA) surveyed the wreck using side-scan technology and multi-beam sonar. 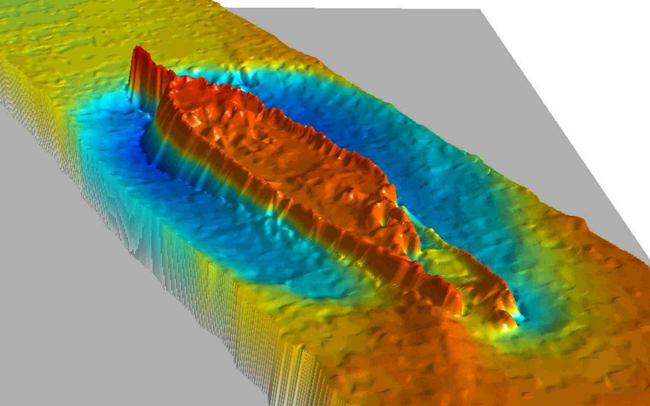 In a web page created in 2006, they used the images to illustrate the capabilities of new sonar technologies. Surprisingly, I can’t find very much information about scuba divers visiting the Maxwell. That may be because of her location since she is in waters that are usually murky, and lies barely outside the shipping channel in a very heavily traveled part of the Bay. Armed with the information I’d uncovered, I launched Thunder Road at Matapeake this afternoon and visited the wreck site of the Herbert D. Maxwell. She wasn’t exactly where the grid coordinates on the NOAA website said she would be, but she was close enough to find with my side scan. I’ve posted the images here below and included some annotations about what I saw. Click the pictures to see higher resolution versions. If you’re like me and relatively new to side-scan technology, you might want to consider a visit to the Maxwell since it’s a great place to test out the capabilities of your machine. 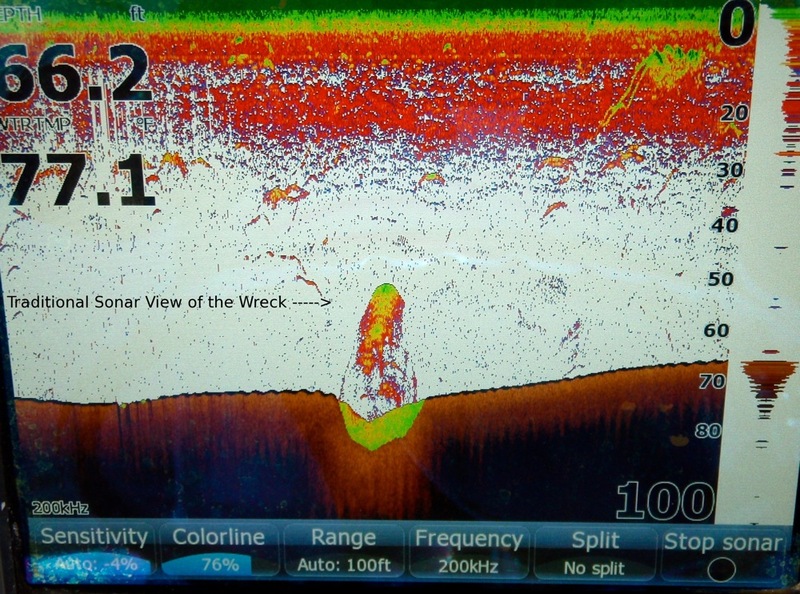 The wreck isn’t too hard to find and is marked on most modern charts and GPS units. She sits mostly intact in 70′ of water off the western shore of Kent Island. 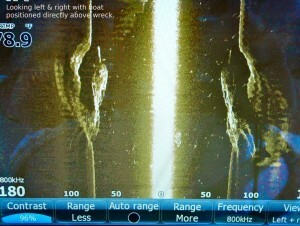 For more information about how side-scan works, check out Glancing Sideways, an informative article by John Page Williams in the May issue of Chesapeake Bay Boating magazine. If you set off in search of the Herbert D. Maxwell, make sure you take a rod and reel and some light tackle jigs. After playing around over the wreck tonight I headed north to one of my favorite fishing locations and had a surprisingly good evening picking fish off a much more modern kind of structure. Really interesting and the images are amazing ! Wow! Thanks, Shawn. 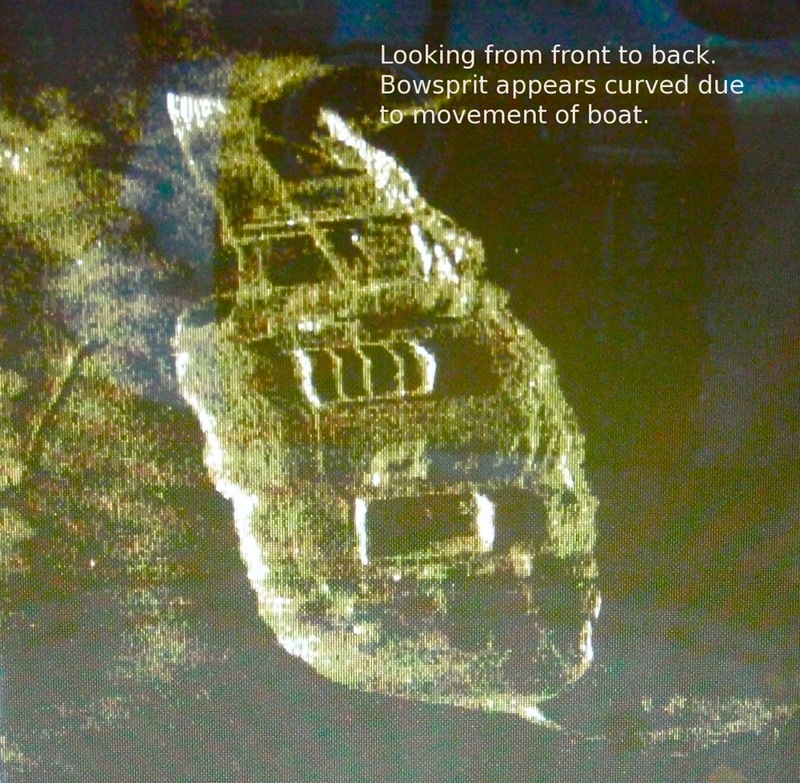 That wreck and her history are a lot more interesting than the slabs of concrete I surveyed in the Severn yesterday, though they may well end up supporting a new oyster reef that anglers will want to know about. 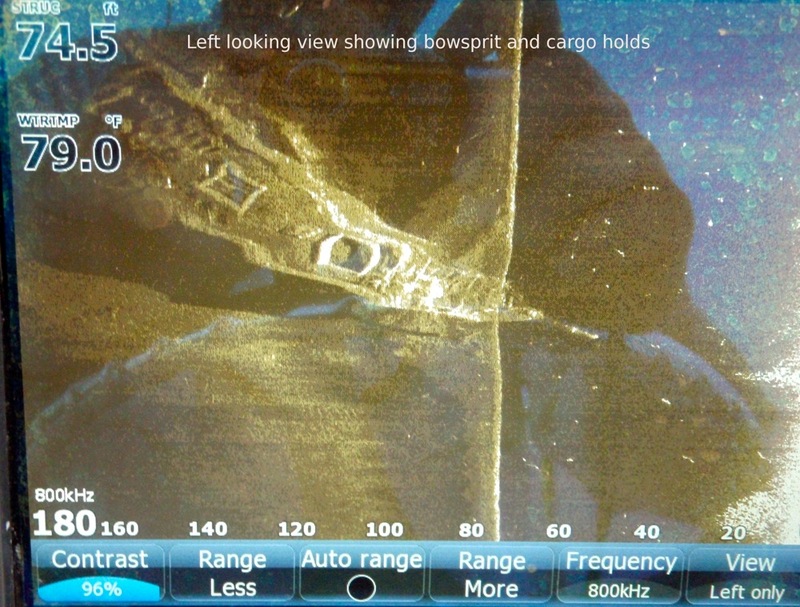 Lowrance StructureScan is amazing! Now I’m going to look for the wreck of the two-masted Mattie F. Dean in Back Creek. A friend from the Northern Neck hauled lumber aboard her in the ’30s. Nice work as always Shawn! Your articles are always top notch! Thank you for the bay history! Wow the channel is 2 miles wide between Matapeake and Annapolis. I’m amazed that 2 ships could collide that long ago. This is a great story and the underwater photos really top it off. I plan to read Mr. Williams article if I can find it but I have a question. Is the ship on a steep rise? It looks like the bow is pointing straight up on some of those pictures. Great – I got such a hard on , I’m stuck under my computer desk. I’ve seen that wreck on my meter but just as a hump. On my to dive list – side scan really helps to ” see ” the wreck. Blue Marlin — She is on a slight slope, but what looks like a steep hill is actually the horizon at the end of the range of the side-scan. Since the bow of the ship is slightly raised, and most of my shots are from the stern forward, the slope looks a lot steeper than it really is because it’s profiled against the horizon. Also, there’s a deep indention directly beneath the ship that makes her look like she’s raised even more. That is caused by current sweeping against the obstruction. 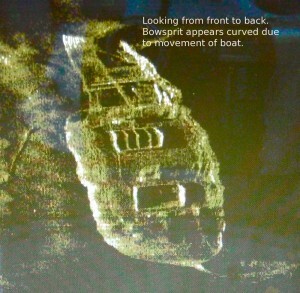 Since the flowing water has no where to go but around, it sweeps away sand and mud from beneath the wreck. That’s a good way to recognize wrecks on a traditional fish finder. A return over what looks like a hole in the bottom is almost always a large obstruction. 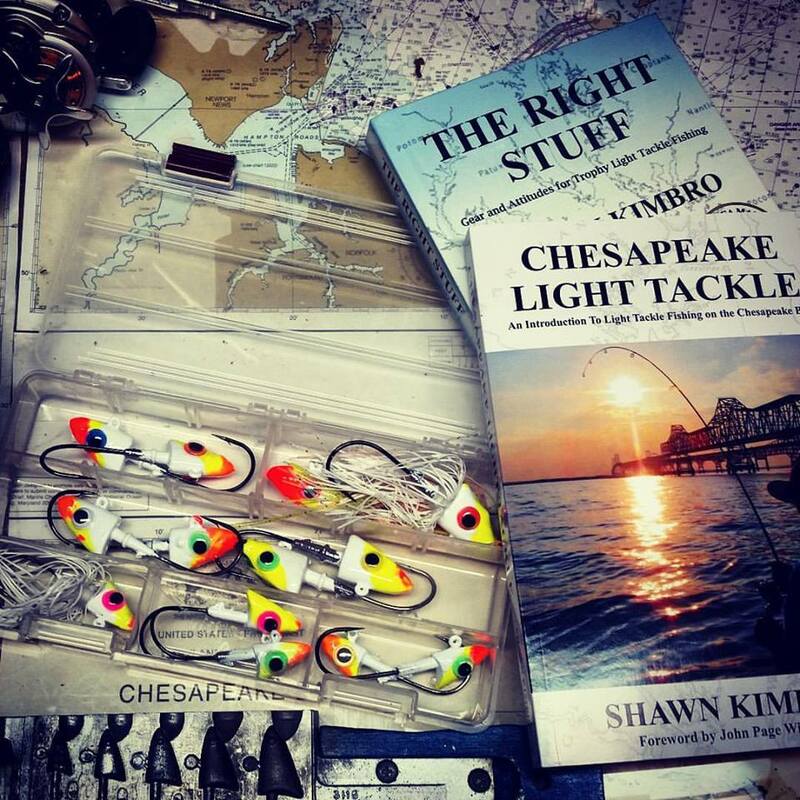 Good stuff Shawn….that Rich is at it again…today he caught a flounder…I told him before we left we were after Rock…..
Amazing detailed pics Shawn, thanks for sharing. I just heard about this website. I’m obviously way behind when it comes to fishing and electronics. These pictures are amazing. I have structure scan but I can’t really say I know how to use it or at least get it tuned in like yours. Would you consider classes? Nah, there’s some people that are a lot better at it than I am. I’m on the hunt for a couple more wrecks, so hopefully can get some pictures up soon. Thanks for checking out CLT though. Hope you’ll stay tuned. Funny thing is I never see anyone fishing it but thats alright. Cant wait to add on the SS to the HDS.Lots of stuff Ive been wanting to check out. I just love local history. This area of Maryland and the Bay are just chock full of history and mystery that many never realize…thanks for showing another chapter. amazing that there is that much of the ship left to see. Very interesting! I have the same shipwreck map…Thank you for the article!